Having good neighbours isn’t guaranteed no matter how affluent the neighbourhood. My friends tell me stories about their neighbour’s behaviour that would make it hard to love them. I’ve watched YouTube vlogs about a problem neighbour someone has and the nightmare of living next to them, with video evidence to prove their point. Can you imagine a neighbour that you have to take to court in order to have them respect your property? I can’t. I never had to. My neighbours always rocked! Each one, on every side, front and back. I never got to know all my neighbours the way I wished. Some of them I’d know only by their faces, and I would greet them with a wave hoping their name would come back to me. Others I knew a little better and we’d have little conversations and give cookies n’ cards at Christmas. Some I could confidently lend and borrow a tool from, and we could share project ideas and talk a little bit about life together. No matter what the degree of relationship, we felt safe with these neighbours we had in Brooklin. There was never an issue, there was always kindness and courtesy, and even when ones would move away (as they tend to do), the new neighbours were just as excellent. Did we miss our neighbours? Absolutely! These are people we saw on a regular basis. People our kids played with. People that look after your home when you are on vacation. These kinds of people are hard to find, I’m certain of it. When our neighbours learned of our departure last year they were excited for us and gave us lots of support. I always hoped that the people who would occupy our house next would be good neighbours to them as well, maybe even better : ) This is how we saw them: as families deserving of our consideration, for the choice we make, of whom we sell our home to – that we make sure we sell to good folks who will “fill the gap” when we leave. I think we have done that. My only regret is not taking the time to know my neighbours better over those 10 years. So here’s to Stanton & Yvonne & Jordan, John & Rose, Krista & Allen, and to all the neighbours we knew only by their lovely faces – We have missed you and the great neighbourhood environment you helped create! We hope that our new home owners, Ryan & Amanda, know just how great you all are and how lucky they are. When we settle down and buy again in some town, I can only hope and pray we get neighbours from the same stock as these. 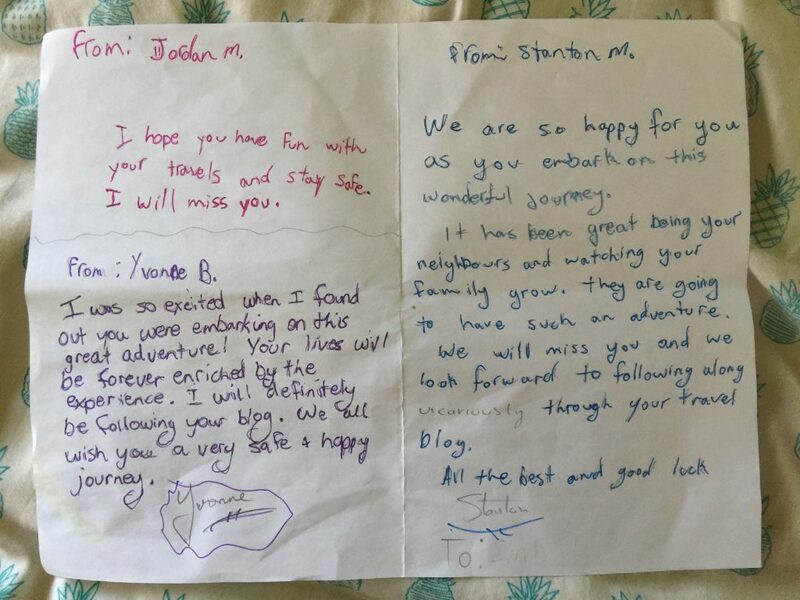 Stanton, Yvonne & their daughter Jordan gave us this card with their thoughts before we left on our journey. Super awesome neighbours!